BATON ROUGE, La. (AP) — As a jubilant sort of mayhem engulfed LSU coach Ed Orgeron, with fans rushing onto the field, the Cajun coach who grew up loving the Tigers calmly looked around and let the spectacle sink in, then hugged wife Kelly. 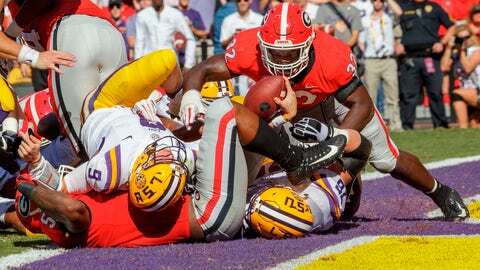 Joe Burrow passed for 200 yards and had two short touchdown runs, LSU’s defense staggered Georgia’s normally prolific offense, and the 13th-ranked Tigers beat the No. 2 Bulldogs 36-16 on Saturday to give Orgeron a signature victory. Nick Brossette added a short touchdown in the final minutes after Burrow’s 59-yard scamper. As the game ended, fans rushed the field, ignoring pleas not to do so from the public address announcer. “The best way we can defend our head coach, who we love, is by winning football games,” senior tight end Foster Moreau said. He said after the game that LSU’s defense presented him with pre-snap formations he had not seen when he studied this season’s LSU games. LSU’s defense registered three sacks and the combination of pressure and coverage seemed to get Georgia’s offense out of synch, with a number of passes sailing to no one. Behind from the beginning, Georgia could not to turn to its running game as much as it might have preferred. Averaging about 245 yards, the Bulldogs finished with 113 at LSU, led by D’Andre Swift’s 72 yards. Elijah Holyfield scored Georgia’s first touchdown late in the third quarter. Georgia: While Georgia had won all of its previous games by at least two touchdowns, none of its previous opponents were ranked as of this week. The game lived up to its billing as the Bulldogs’ toughest test yet, and a Georgia offense that came in averaging 42.8 points looked uncomfortable.